Approximately one month ago, classes began at Belmont University, and thus began the chapter of my life we’re calling “Nashville Nancy.”1 A little over a month ago, my friends and I threw a few last items into a U-Haul, left Athens, GA, and drove to Nashville, TN. We arrived around 10 p.m. unloaded the U-Haul, and almost died moving my piano in – the issue was primarily a couple of bad angles (coming down the U-Haul ramp & turning into my front door). After much sweat, anxiety (on my part), and thanks to Jonathan’s piano moving experience, all of us (including piano) survived relatively unscathed! All of this made a bit of a negative impression on my new neighbor, who objected to our endeavors generally. Now that I’m moved in, I never see him, so I’m assuming our relationship is now fine. My amazing friends stuck around for a couple of days; we did some shopping for exciting things likes brooms and cleaning products; we unpacked some and poked around my new neighborhood. Then they loaded up and headed back to the best little college town in the world – the place that has been my home for the past 18 years. And I was left in my new quadplex (er, quadroplex? ), alone with a bunch of boxes. The past month has flown by, and has for the most part been a bit like a whirlwind. Belmont University is beautiful. Every day that I walk onto campus, I’m amazed at just how lovely everything is.2 I also love that I walk past the Bell Tower (and Carillon) every day (think the Arch at UGA), and not infrequently someone is playing the carillon! I’m teaching four classes this semester: two sections of music history (a version of the class I taught at UGA in the spring) on Tuesday/Thursday, and music appreciation (with a different text book) and world music on Monday/Wednesday/Friday. Technically, world music is the only new class for me – although I was planning to teach a version of this class at UGA this fall, so the prep isn’t from completely from scratch, but is basically completely from scratch because procrastination. Classes have been going mostly well, and my students have exceeded my expectations. I have a student who already met with me because she is interested in ethnomusicology, and several students have visited me during office hours just to say hi. I’m starting to get to know my colleagues in the School of Music. I just signed up for a Teaching and Learning reading group, and I will be connected to a mentoring group soon. I’ve visited four different churches, and they have all been very, very different. There is certainly no shortage of churches in Nashville, TN! While this endeavor has been fun & fascinating, it does make me appreciate & miss Watkinsville a ton. I have one or two more mega-churches on my list to visit just for fun (research?) and then at least three churches that are in my neighborhood that I’m hoping one of which will end up being my Nashville church home. I haven’t done much socially because I’ve either been unpacking or scouring thrift stores for furniture, etc. or trying to keep up with my classes. Also, AmericanaFest was a week or so ago, and I am just now catching up from that fun & seeing my Bloodshot pals! This coming week and next, I hope to start reaching out to Nashville friends & doing things like visiting the Country Music Hall of Fame and Museum. I’ve already had several visitors from Georgia AND Kentucky, and after this weekend, I’ll actually have a (twin) bed in my spare bedroom. If you find yourself in the area, stop by and say hi! 1. I believe it was Wade who first used #NashvilleNancy. 2. And in the interest of transparency, every day I also wish that I could park closer to the School of Music. Several folks have asked about my moving plans, so I thought I’d procrastinate packing update the blog & let y’all know what’s going on! I spent the past few days in Nashville for faculty meetings, workshops, and trainings. I’ll admit that walking into the Curb Event Center on Monday morning for the Fall Faculty Workshop was intimidating. Imposter syndrome is real, y’all. We were assigned tables, and I was with folks from marketing, pharmacy, occupational therapy, and sports science. Everyone was nice, although one of the older guys was stereotypically & entertainingly jaded and cynical (so much so that one of the other guys at the table pulled me aside and said, “This really is a great place to work.” I wanted to tell them all, “You people have no idea what it’s really like out there!”), but I digress. Once things got going, it was as exciting as you might (or might not) imagine. It also helped that I quickly saw one of my sorority sisters who has been on the faculty at Belmont for over a decade! Day two was the College of Visual and Performing Arts “Fall Retreat,” which was a much smaller group. This event was held in the room where the International Country Music Conference is often held, and felt much more comfortable. I met several School of Music faculty, and the high point was that we sang the Doxology for the blessing for lunch. The low (but necessary, I suppose) point was the active shooter training. The Belmont Bell Tower and Carillon – yes, there is a musical instrument housed in this structure! This morning was the School of Music faculty meeting. I got to meet more of my colleagues and see more of the facilities where I’ll be spending my time. There are lots of changes afoot at Belmont and specifically within the School of Music, and everyone seems (mostly) excited about all that’s going on. Also, I’m encouraged by how nice the folks are, and how competent the administrators seem. If you’ve been in any educational setting, you know how important that is. I am in the process of signing a lease, and am excited about living in East Nashville. I definitely felt judgment from non-East Nashville folk (Belmont & Vandy are on the other side of town), but I feel good about the decision. I’ll be in very close walking distance of a couple of restaurants, and practical walking distance from Five Points. The plan is to finish packing and tie up loose ends in the next couple of days, load up the U-Haul on Friday, get my place ready to AirBnb, and then after church on Sunday, head to Nashville with a few close friends who are helping out! If you need me in the next couple of days, I’ll be sitting on the floor in one of the rooms of my house freaking out and maybe packing. I just read through the course evaluations for my two classes that I taught at Large University this semester (music history 2 for music majors & popular music for non-music majors). I have seen enough course evaluations (or class climate surveys or whatever they’re called) to know that they should mostly be taken with a grain of salt; but I also believe they provide valuable information for me, especially for a new-to-me class or format, something that this article also points out. One of my mentors used to say, “Every class has its own personality.” Sometimes classes just work, and sometimes they don’t work. Thankfully, this one did. Yet while I bask in the positive here, I am not naive: I worked my tail off this semester & at times I was barely hanging on to my four jobs by a thread; not to mention the state of contingent/adjunct/part-time faculty is pretty much one big mess; plus, I still don’t exactly know how I will pay all of my bills in academic year 2018-19. Yet for now, it’s mostly working for me, and I’m grateful for the chance to talk about music while still having some sort of positive influence on a group of (mostly) talented and interesting emerging adults. But to the one who didn’t think my jokes were funny: you’re so wrong. And to the one who said, “Please hire her as a full-time professor!”: obviously, you are a genius. 1. A portion of this positive feedback was a referendum of sorts on the students’ rather miserable and disastrous Music History I experience, as many stated in the comments; but I’d like to believe at least some of them had an objective opinion about our class. Also, to the many students who said 70 was too big for this class, I agree. 2. One student said that these sorts of gestures & comments “made me feel like there was at least one person in this building who cared about me. Thank you for that.” Yikes. Also, students did actually say they learned a great deal & the majority of respondents said that the class challenged them to think and learn. Something that I’ve come to terms with as an adult is that life is often about trade-offs. The freedom of (single, childless) adulthood is awesome, but often it comes at a cost. That is, awesome things regularly require an exchange for something not-so-awesome. The catch is knowing what the trade will be going into the situation, and accepting the terms. Time? Money? Relationships? Fun? Sleep? You gotta know what currency (and amount) are you willing to pay for the awesome thing! As I mentioned in my last post (two in two weeks! ), the benefit of having my four jobs is flexibility, while the downside is making up work and/or not getting paid. 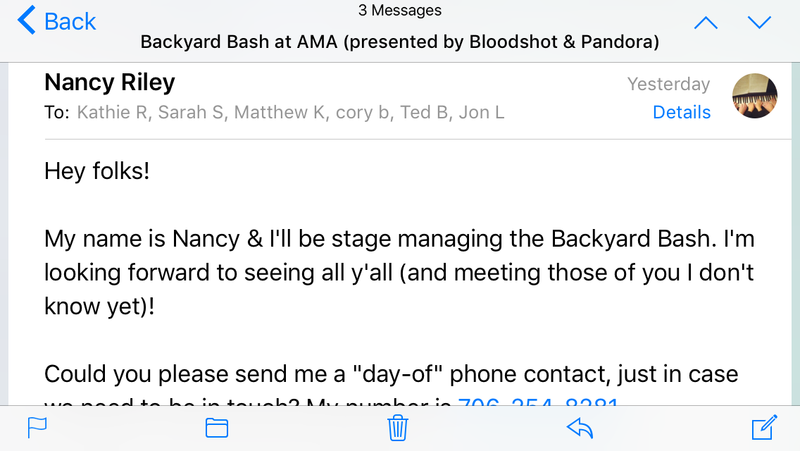 Next week, I’ll head up to Nashville for the Americana Music Festival, where I’ll get to see a ton of great live music, see a bunch of awesome people, and also help out with the Backyard Bash (sponsored by Bloodshot & Pandora). However, it also means that I get to email (and receive email from) some really cool musician-types about the party next week. I am totally willing to trade my “free time” to do work right now (even though it’s a little bit stressful, and honestly, annoying, and really, I’d much rather be in bed…) for the fun and freedom of heading to AMA next week. It’s an adult thing, I guess. 1. It also probably has to do with the fact that I have been known to put things off until, well, later. I started this SXSW recap WAY back in March… like, in a very timely manner. Good intentions and all that… but I’m still a procrastinator at heart. So as I gear up for my second AmericanaFest with Bloodshot in September, let’s throw it back to March. 2017 marked the the FIFTH time I’ve been to SXSW! Fifth. As in, five years. Like last year, I opted to go wristband-less; unlike last year, I was not showered with gifts and love by Airbnb.1 Instead, I was greatly concerned about transportation since Uber & Lyft were voted out of Austin this past year. Thankfully, many companies have stepped into the ride-sharing vacuum, and for the most part, I was able to get around town without any trouble. The awesome thing about having four part time jobs is that there is a great deal of flexibility in one’s schedule. The downside is that you generally have to make up anything you miss, and/or you don’t get paid. This means, I opted to teach my Tuesday morning class and stress myself out getting to the airport on time for my flight. I made my flight, and got to Austin (via St. Louis) in time to catch a few things Tuesday afternoon/evening. And then, the week was in full swing. The basic components of my schedule are now standard, including the Bloodshot showcase at the Continental Club on Wednesday, the TwangFest/KDHX Day Party at the Broken Spoke on Thursday, and Bloodshot’s Yard Dog Day Party on Friday… and whatever else I can get to in-between and around all that. This year, I was pretty pleased with the “in-between” stuff I managed to get to. Fantastic Bloodshot product for sale! Jon Langford & the Far Forlorn at the White Horse; I caught a few songs by Corinne Rose before Jon went on. I finally made it to one of the best restaurants in the world: Bouldin Creek Cafe. And then headed to El Mercado to catch Whitney Rose & Sunny Sweeney. They’re both great, but I loved Sunny Sweeney. From there I landed at a super hip coffee shop, Seventh Flag Coffee, to get some work done (including filling out my brackets). I need to just come to terms with the fact that I will never see the opening bands (or more) at the TwangFest/KDHX Day Party at the Broken Spoke. This year, I missed Patrick Sweany, Ha Ha Tonka, and High Plains Jamboree, but DID catch Sarah Shook & the Disarmers, Band of Heathens (although I wasn’t entirely paying attention to their set, because food…), Secret Sisters, and Lillie Mae. I left the Broken Spoke and booked it over to Yard Dog to catch a solo Cory Branan set, and then I made my way to the Saxon Pub to catch a band called Churchwood, and to interview Bill Anderson, who happens to play in that band, but was also in the Bloodshot band, the Meat Purveyors. I interviewed Bill, on the record, and then after some much need late-night food, headed home. The Bloodshot Yard Dog party start with Zach Schmidt (Nashville-based guy, cute, and charming as heck), followed by The Yawpers, Ha Ha Tonka, Sarah Shook & the Disarmers, Cory Branan, Banditos, and last, but certainly not least, the Waco Brothers. A few items of note…. Sarah Shook & the Disarmers are the most recent band (at the time) added to the Bloodshot family. And they are great. I met Sarah in Nashville at AmericanaFest, and though I didn’t hear her play then, she was highly recommended by a friend & former Bloodshot employee, so I took his word on things. He was right. I always meet new folks during this week, and this year, I met a few people with connections to Bloodshot, and a couple of gals who are good contacts for my academic and scholarly pursuits. But I also got to hang out with all my Austin pals, and got to share some music & a drink with folks that I know from ICMC! 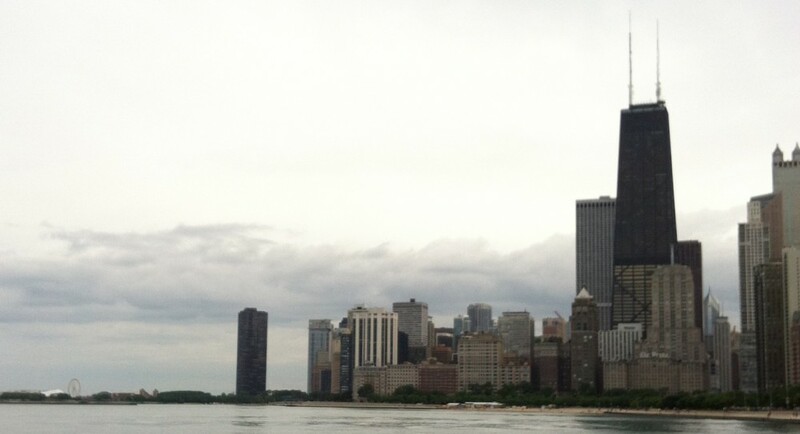 South by generally affords a few (or more) wild and crazy moments, (of varying degrees). This year was no exception. For instance, I found myself in the backseat of a car with Jon Langford (which is exciting in and of itself, and no, we were not making out; but I’d totally support that rumor…) listening to a track off his upcoming album (Four Lost Souls recorded in Muscle Shoals) from his iPhone. As an old lady, it is inevitable that at some point I find myself thinking that SXSW might not be worth it and/or I’m just too old for it. But of course, looking back at the great music I experienced throughout the week, along with all the folks I get to hang out with… I’m guessing you’ll find a similar recap here next year. 1. I did have a heck of a time booking a place to stay, including TEN confirmed bookings & NINE cancellations via Airbnb, but that’s another story for another blog post… one that likely won’t get written. 2. I was only vaguely familiar with Roky, but it was pretty cool to see him perform at this super cool and historic venue. 3. I admit that due to being an old lady, I left before Aaron’s set was finished. However, I managed to catch him playing in Athens at the 40 Watt in a New West Athfest kickoff show. I was greatly disappointed that he was not wearing a cape at the 40 Watt show. Trust me when I say that I have treated these little plants with equal (moderate-to-low levels of) commitment. But clearly, the results are varied: one is thriving and has even grown new leaves; the other is dying a rather quick death. I’m only a little bummed because these cost a bit more than $.89, but I can’t be too sad, since at least one of them is doing so well. I gave a final this morning, and as a student turned in her exam, she said, “I have thoroughly enjoyed being in your class this semester. Thanks for caring about music and caring about us.” It was one of those moments that make me so thankful to get the opportunity to teach college kids about music/culture/history. Likely around the same time that this was happening, I received an email from another student in another class, stating, “hey, what’s this Mozart composer guy. there’s like at least two or something. ?? ?” It was one of those moments that make me question my life choices, while simultaneously inspiring rage and maniacal laughter. This sort of feedback is just beginning, so let’s all hope that stories like the former are more prominent than the latter. Happy finals week, folks! 1. Please note that I exert at least a moderate-to-high level of commitment to my students. Er, most of the time.